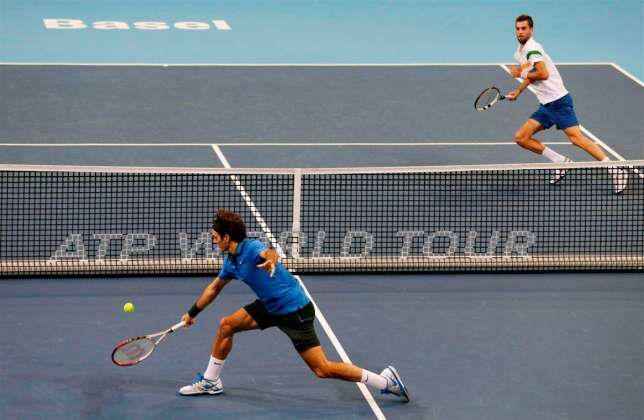 Swiss maestro Roger Federer easily defeated Benoit Paire 6-2 6-2 late Friday night in Basel, Switzerland. Behind a strong serve and great variety, the Swiss set the tone of the match from start to finish. Requiring only 54 minutes, Federer hit 4 aces serving at 64%, but won a dominating 96% of points on his first serve. Break chances were plenty, but only four were needed. Earlier in the day, Paul Henri-Mathieu defeated Grigor Dimitrov 7-6 7-6. Anticipation was rising for the potential semifinal between Federer and the young Dimitrov, who resembles a strikingly similar game. Federer will face Mathieu in second semifinal of the Swiss Indoors on Saturday, preceded by Del Potro vs Gasquet (2:30pm Basel, US times: 8am EDT/5am PDT). Watch both semifinals on FF07tv. FedererFan07.com – the #1 Federer site.